Studies show 65-84% of new parents bring their baby to bed with them at some point during the first 6 months. Snuggle Me meets a very real and unmet need for families. With our multi-functional, comfortable, and high quality lounging and co-sleeping system, Snuggle Me provides a safe space within the family bed so parents can feel confident in baby’s position during the night, allowing them to relax and get the rest they need. Babies spend 10 months tucked securely inside their mother’s womb. After babies are born they seek this same familiar confinement. Snuggle Me is uniquely designed with an un-padded center-sling which gently draws in against baby’s sides when laid within the center-sling. 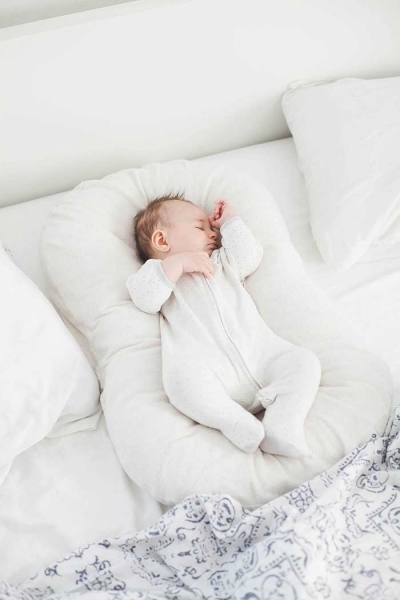 It hugs and supports baby which helps relieve common sleep issues like startling awake, wanting to sleep in a parent’s arms, or resisting sleep while in the safer supine position. Our closed system ensures baby remains in their safe sleep space while our patented center-sling snuggles them as though they are being held, recreating the natural feeling of the womb. Snuggle Me Organic is designed to fit the torso of the baby, not the entire length of the body. This guarantees a healthy neutral spine, a secure fit so baby cannot roll or flip while nestled in Snuggle Me, and a safe sleep space for everyone in the family. Snuggle Me is made with fully breathable materials sourced only from the USA. We're a CPSIA small batch manufacturer complying with all government safety standards in our division. All of our fabrics adhere to CPSIA certifications, which are the strictest certification standards in the world. Snuggle Me is multifunctional. It is used for co-sleeping, play-time, tummy-time, personal lounge space, resting, and bonding. It is easily moved around the home and conveniently portable for family vacations. Minnesota made and organic. As mom's ourselves, we understand a parent’s desire to protect baby, and keep their baby’s environment safe and free from synthetics and chemicals. Because of this understanding we have chosen to produce Snuggle Me using only CPSIA certified fabrics. The CPSIA has the highest safety standards in the world. An important value for our company is to stay close to our Minnesota roots so we employ local, Minnesota sewers and manufacturers to produce our products. We are thoughtfully linked with our teams in this way and so can assure the highest quality for each Snuggle Me created.